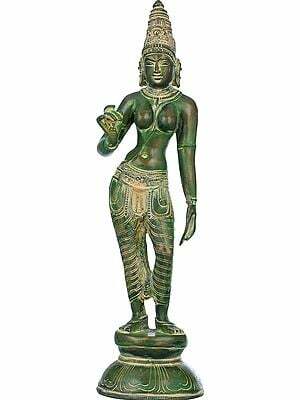 Bronze is a select medium, somewhat of the elite as opposed to brass, in sculptural traditions across the world. 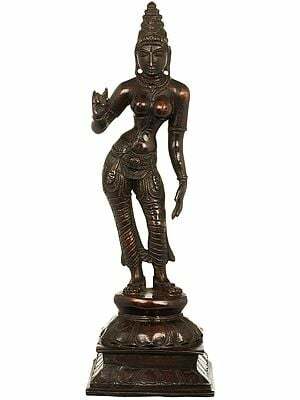 Having flourished in the South under the patronage of the Chola dynasty rulers, it continues to be the medium of choice for sculptors devoted to spiritual art. 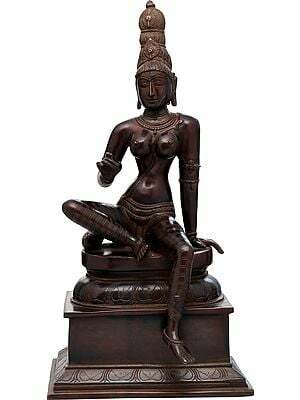 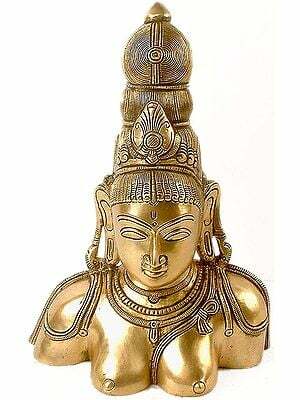 In this seated depiction of the most popular of Hindu devies, bronze brings out the ethereal beauty of Parvati, the wife of Shiva who is responsible for the cyclical destruction of all creation post preservation. 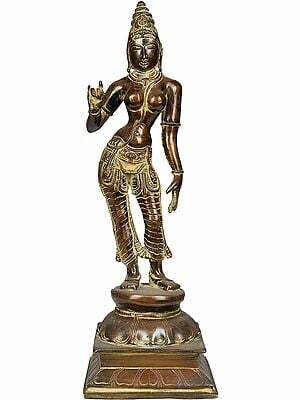 It has been handpicked from Swamimalai, the home of modern bronze art. 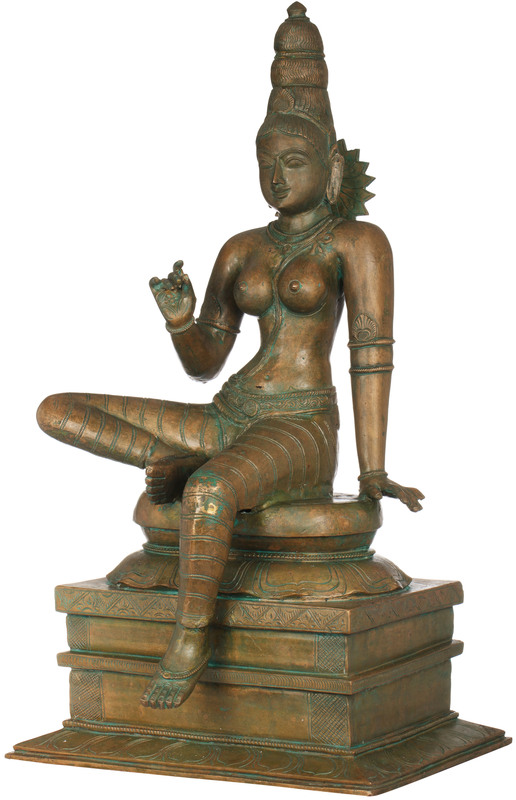 Her long gracious limbs are arranged in the characteristic lalitasana; one hand supports Her frame on the inverted lotus asana (seat), while the other seemingly holds a flower. 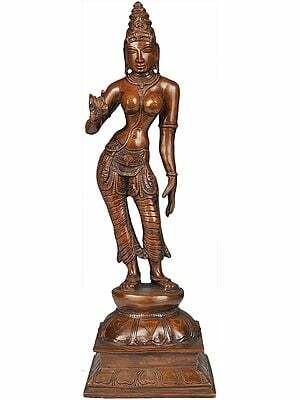 Her lissome proportions are matched by the typical Southern-style crown resting on Her haloed head, tri-layered with a lotus petal in the centre at the hem, with a generous proportion of Her gorgeous locks escaping from underneath. 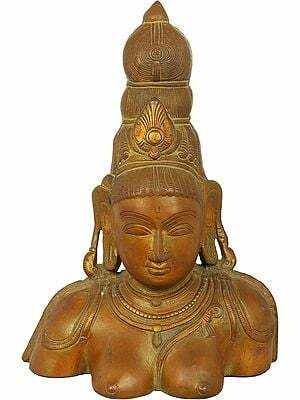 Note how the rays of Her halo resembles the petals of a freshly bloomed lily. 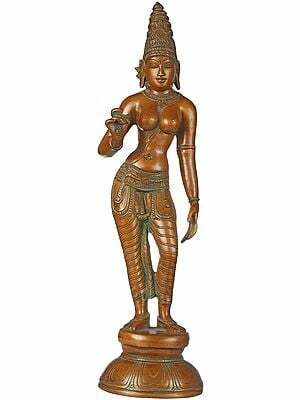 Her shringar is relatively simple but replete. 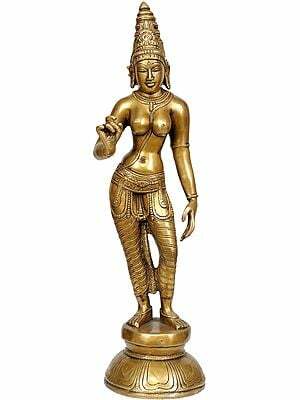 A clutch of necklaces, a sash cascading down across Her distinctly maternal torso, a kamarband to hold the silken dhoti in place, and a profusion of bracelets all along Her arm and anklets and rings. 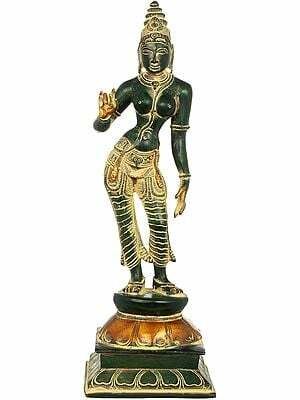 Her sweet sharply featured face is framed by long, kundala-laden ears, the beautous brow dotted with an elongated bindi. 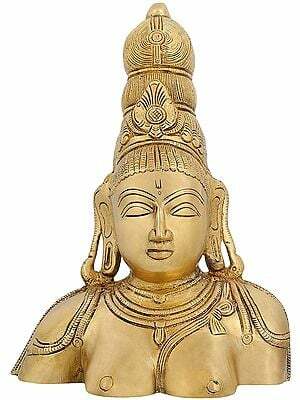 Despite the minimalistic sculpture of the countenance, the radiance of wisdom and maternal calm pours forth from the composure. 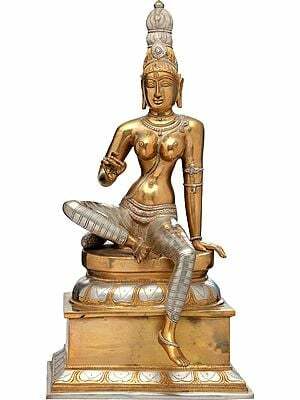 Note how the silk of the dhoti clings against Her superb musculature, revealing Her divine proportions. 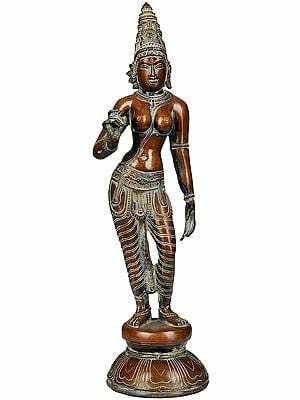 In fact, the hallmark of good sculpture lies in the precision with which the limbs and the digits are carved. 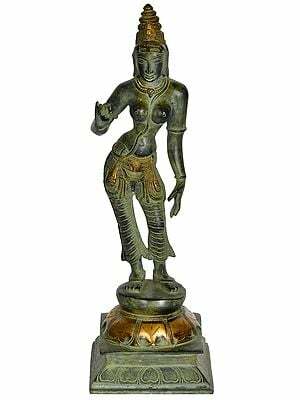 The pedestal is atypical of Indian iconography - numerous layers, freshly blooming lotus, a world of intricate engraving in each layer.